“Pearls and White Satin” Necklace: Refined Fashion Accessory Jewelry of Gold Seed Beads, Metallic Beads, and Pearl White Beads. These Reclaimed Vintage Beads Were Originally Detailing the Collar of a 1950’s White Sweater! A Unique Jewelry Piece With a Past. 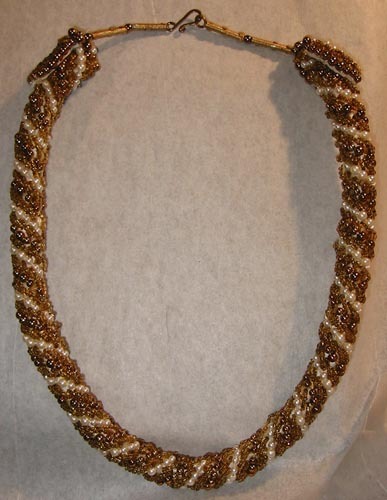 This Handmade Necklace is Hand-Beaded in a Spiral of Alternating Beads. Each Row of Beads Has Been Hand-Sewn to a White Satin Tube. An Internal Wire Armature Core Allows This Designer Necklace to be Shaped and Fitted to the Neck. 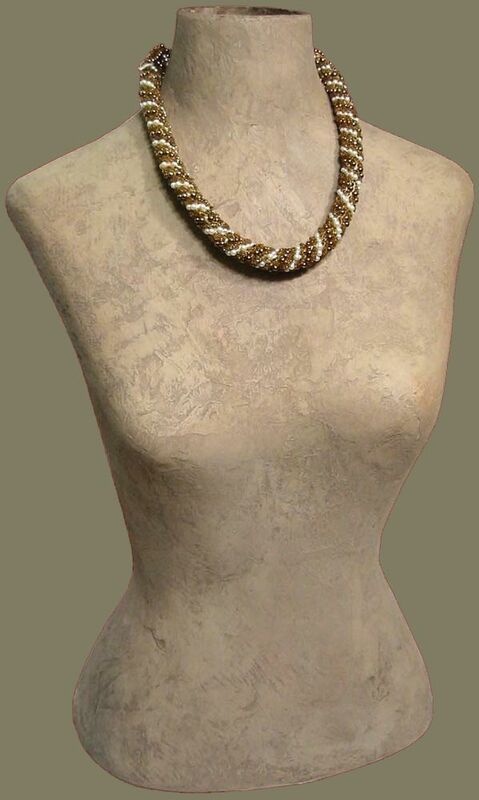 Cast Brass Metal Tube Beads From the Ivory Coast Lead From the Brass Hook and Eye Clasp at Back Neck. Style With Flair Fashion Jewelry From the Artisanaworks Studio.